So far, we’ve had Dove, Nivea, and now H&M in trouble for alleged racism in their advertising campaigns. 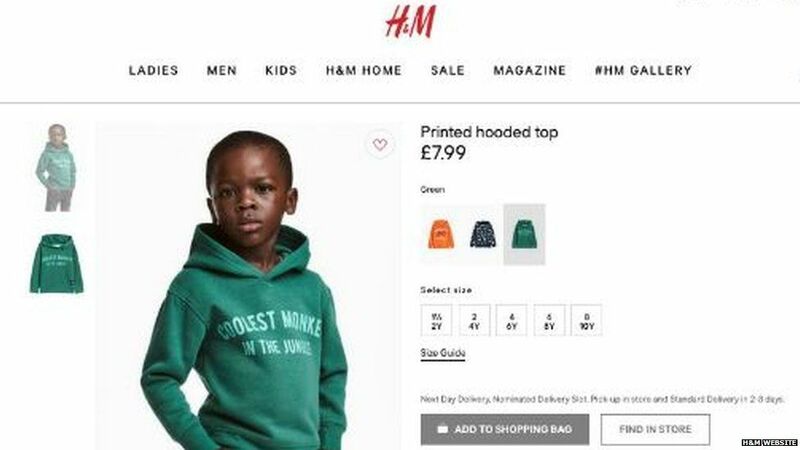 The Swedish retailer has recently received criticism for showing a young black child modelling a “coolest monkey in the jungle” hoodie sweater. H&M have now apologised for the advertisement and it has now been taken down. H&M wrote regarding the controversy coupled with an apology over Twitter, stating that they had pulled the product as well as the advert. Both The Weeknd and rapper G-Eazy have announced that they will be ending their partnership with H&M. G-Eazy was due to release a clothing line with H&M in March this year, so that won’t be happening now. If you wanted a leather jacket in the style of G-Eazy from H&M, then that’s not going to be a thing anymore. Other black celebrities, including rapper and producer Diddy and footballer Romelu Lukaku have also responded to the controversy, by editing slogans of black positivity on the hoodie. H&M have not argued their side of the case, and agreed with the criticism the ad received. Speaking to BBC Newsbeat, spokesperson for H&M say they are “deeply sorry” for the incident. Meanwhile, the actual mom of the black child pictured in the hoodie has told people to “stop crying wolf”, and that she also “really doesn’t understand”, nor is bothered by the advertising photo. We were hoping that stories of controversial ads would die last year, but it looks like they’re making an appearance this year too. It’s almost as if big brands and corporations are on the payroll to spread some form of racist advertising propaganda test, and then watch the reaction of the general public. Stay tuned for more incidents of bad advertising, because it’s probably going to inevitable at this point.